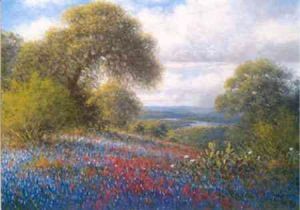 Throughout the Texas Hill country, Bluebonnets and Indian Paint Brushes signify the coming of Spring. Pastures that once were filled with the signs of winter spring to life with the vivid colors of these wildflowers. What once seemed to hold life only to a lonesome cactus has blossomed into a beautiful view on the "April Afternoon."